The ISSCR Annual Meeting will be held in Los Angeles, California from 26-29 June, 2019. this four-day program features more than 200 speakers from around the world, demonstrating the excellence of stem cells and regenerative medicine research. 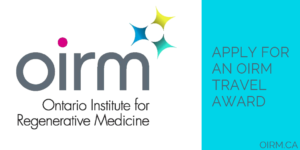 OIRM is offering travel awards to help support trainees attendance at this meeting, please submit your abstract directly to ISSCR by February 6, 2019 to be considered for an oral or poster presentation. Early registration closes March 3, 2019.